Online offer only. Prices are valid on travel from 01 April - 22 December 2019. Must book by 30 April 2019. Rates may be higher during holidays and special events. Promotion applies to participating European destinations only. All accommodations are subject to availability. Full payment for the accommodation must be made at the time of booking. A credit/debit card processing fee may apply. If you cancel your reservation no refund will be due. A maximum of sixty (60) nights can be booked with this offer. Minimum three-night stay required. Rates listed are per night. Transportation, taxes and all other incidental charges are not included. Other restrictions may apply. 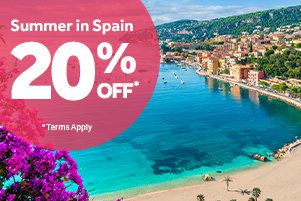 For more information, please call our European reservations team on +44 (0)800 358 6991 or our U.S. reservations team on 1.888.990.9569 and mention code SPAIN19. If you enjoy panoramic views of the ocean, snow-capped mountains and plenty of sun and sand, then the place for you to be is in San Miguel de Abona in Spain, and the place for you to stay is at the Sunset View Club. 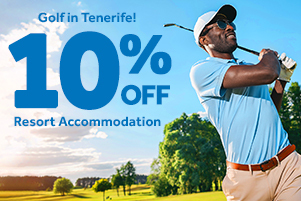 Here you will find the Golf del Sur estate, which is at the southern tip of Tenerife, and you can play on the greens on the prestigious PGA-sanctioned championship golf course. You and the kids can even enjoy a few rounds of miniature golf, as well as other sports, including tennis and squash. Guests at the Sunset View Club can enjoy basking in the sun all day long, either at the pool or on a sandy beach, and there are some great casinos that are less than ten miles from the resort, which is not only in Spain, but also just a few miles from the coast of Africa. There are so many wonderful things to see and do in the area that it will take more than one vacation to fit in everything. You can enjoy plenty of great shopping, relax on the beaches, take in some nightlife, and take part in many outdoor adventure activities, including swimming, windsurfing and whale watching. The Sunset View Club boasts a heated outdoor pool and heated outdoor whirlpool, and even its own solarium, where you can see all of the constellations. There are also ping-pong tables available, and if you like, you can challenge your friends and family members to a match or two. The nearest beach is just six kilometers away from the resort, the marina two kilometers away, and fabulous shopping is just 50 meters from your room. When you stay at the Sunset View Club, you will be treated to modern and comfortable accommodations. You can choose from one and two bedroom units, both featuring partially equipped kitchens for making snacks and small meals. The one bedroom units have tasteful bathrooms, as well as flat screen televisions with DVD players. All one bedroom units have large balconies. If you choose a two bedroom unit, you will have a modern living space with two bathrooms. There is no vacation destination in the world quite like Spain, and no resort as beautiful as the Sunset View Club. Enjoy a romantic getaway, or a fun-filled family holiday. There is plenty to see and do for everyone, and you will be glad that you decided to make the Sunset View Club your next holiday destination.